In short: A fine German sport sedan with great fuel economy. Diesel-fueled vehicles in this country are perceived as noisy, slow and prone to belching clouds of soot-filled exhaust, despite their superior fuel economy. Those perceptions were mostly valid—until recently. Rising gasoline costs, stricter emissions standards and engineering advancements have converged to make diesels socially acceptable, which has given Mercedes-Benz reason to offer them in the U.S. again. The BlueTec part of the Mercedes E320 moniker denotes a new technology that cleans up diesel exhaust and allows the engine to run on new, ultra-low sulfur diesel fuel. Let’s skip the science lesson of how it works and just say that this new diesel engine runs as cleanly as any gasoline engine, at least in the eyes of 45 of our 50 great states. The emissions requirements in California, Maine, Massachusetts, New York and Vermont are still too strict, but Mercedes will have a 50-state version of BlueTec available in more models beginning in the 2008 model year. The typical pocketa-pocketa noise associated with diesels is present but never obtrusive, and is reduced to background noise once the car has warmed up. The muting is partially due to typical Mercedes quietness, but even standing outside the vehicle listening to it idle, it’s not loud, just different. Our E320-B exhibited a bit of sluggishness when accelerating from a stop when cold, but smoothed out as soon as engine temperature had generated. The turbocharged, 3.0-liter, 208-horsepower V6 engine propels the BlueTec to 60 mph in a factory-tested 6.6 seconds, only a tenth slower than its E350 gasoline-fueled sibling. The diesel gives up 68 horsepower to the E350, but more than makes up for it with 142 more lbs.-ft. of torque (400 in total) delivered lower in the rev range. Tromping the throttle from zero invokes the traction control and sends its warning light into a flickering frenzy before settling down to accelerate through the seven-speed transmission. Fuel mileage performance is a key area where the Bluetec shines. 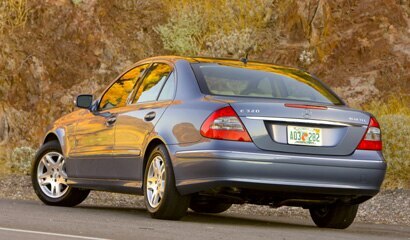 The diesel’s EPA fuel numbers are 26 mpg in town and 37 mpg on the road while the E350 only manages 19 and 26 respectively. Our car delivered 29 mpg with an aggressive right foot during commutes of mixed driving. The base price of the diesel is $1000 more, but you’ll go further on each gallon of fuel. While the BlueTec was in our possession, diesel was 40 cents cheaper per gallon, accelerating the rate of return. Further, diesel prices have remained level for the last two months while gasoline costs have fluctuated wildly. Depending on future oil prices, the cost savings on the diesel is a no-brainer. 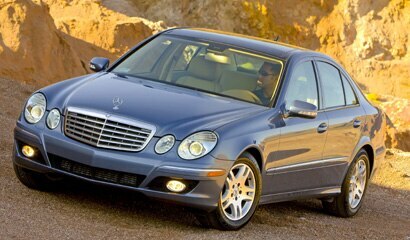 Of course, the E320 BlueTec cruises quietly and confidently in true Mercedes-Benz fashion. Even over the worst of busted up pavement, absolutely nothing upset this car, a testament to typical Mercedes solidity. In this day of oversized wheels and tires, the E320 handles extremely well on 16-inch alloy wheels shod with Michelin tires. Our Platinum Blue BlueTec was equipped with a host of standard luxury and safety equipment including burl walnut trim, a harmon kardon surround-sound system, and front and rear side-impact airbags in addition to head-curtain airbags. Options included HID headlamps with curve illumination, navigation system and satellite radio topping the sticker at $57,835. When you’re spending that on a great road car, fuel economy is hardly a concern. But the efficiency of a BlueTec diesel promises a good return on your investment.